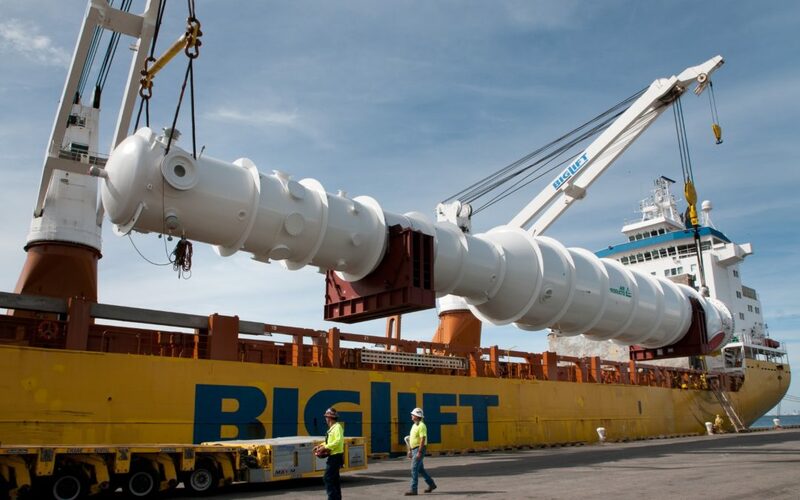 PALMETTO, Fla. – Demonstrating its exceptional capabilities for moving oversized and heavy project cargo, Port Manatee has handled export shipment of a nearly 500-ton liquefied natural gas (LNG) heat exchanger manufactured at the Air Products production facility across U.S. 41 from the port. Air Products, the world’s leader in LNG technology and equipment, chose the Manatee County location due to its immediate proximity to Port Manatee and easy access to the berth, as well as because it removed constraints on the size of LNG heat exchangers to be shipped. The 32-acre Air Products Port Manatee facility started production in January 2014 and rolled out the first completed LNG heat exchanger in September 2016.